iPhoto is a discontinued digital photograph manipulation software application developed by Apple Inc. It was included with every Macintosh personal computer from 2002 to 2015, when it was replaced with Apple's Photos application. Originally sold as part of the iLife suite of digital media management applications, iPhoto can import, organize, edit, print and share digital photos. iPhoto was announced at Macworld 2002, during which Steve Jobs (then-CEO of Apple) also announced that macOS would be installed standard on new Macs from then on, and revealed new iMac and iBook models. On March 7, 2012, Apple CEO Tim Cook announced an iOS-native version of iPhoto alongside the third-generation iPad. On April 8, 2015, Apple released OS X Yosemite 10.10.3, which includes the new Photos app. iPhoto and Aperture were discontinued and removed from the Mac App Store. 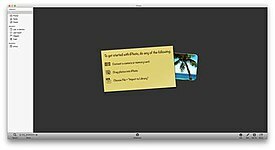 iPhoto is designed to allow the importing of pictures from digital cameras, local storage devices such as USB flash drive, CDs, DVDs and hardrives to a user's iPhoto Library. Almost all digital cameras are recognized without additional software. iPhoto supports most common image file formats, including several Raw image formats. iPhoto also supports videos from cameras, but editing is limited to trimming clips. After photos are imported, they can be titled, labeled, sorted and organized into groups (known as "events"). Individual photos can be edited with basic image manipulation tools, such as a red-eye filter, contrast and brightness adjustments, cropping and resizing tools, and other basic functions. iPhoto does not, however, provide the comprehensive editing functionality of programs such as Apple's own Aperture, or Adobe's Photoshop (not to be confused with Photoshop Elements or Album), or GIMP. iPhoto offers numerous options for sharing photos. Photo albums can be made into dynamic slideshows and optionally set to music imported from iTunes. Photos can be shared via iMessage, Mail, Facebook, Flickr and Twitter. Creating and sharing iCloud Photostreams are possible as well, both public and invitation based ones. iPhoto can also sync photo albums to any iPod with a color display. These iPods may also have an audio/video output to allow photos to be played back, along with music, on any modern television. Additionally, photos can be printed to a local printer, or, in certain markets, be sent over the internet to Kodak for professional printing. iPhoto users can order a range of products, including standard prints, posters, cards, calendars, and 100-page hardcover or softcover volumes—again, such services are available only to users in certain markets. At an Apple media event on March 7, 2012, Apple CEO Tim Cook announced a new version of iPhoto for use on the iOS mobile operating system. iPhoto for iOS was made available that day on the App Store for US$4.99 alongside the already-released iMovie and GarageBand for iOS. It was officially supported on the iPhone 4 and later, iPod Touch (4th and 5th generations), iPad 2 and later and iPad Mini (1st and 2nd generations), but hackers discovered that it could be installed manually on older devices using Apple's iPhone Configuration Utility. iPhoto for iOS offered a feature set fairly comparable to that of its Mac counterpart. It could organize photos that were synced to the device or taken with its camera. Editing features included color correction tools and photo effects, as well as cropping and straightening tools. iPhoto for iOS lacked tools for creating books, calendars, cards and ordering prints, though it could create "Photo Journals"—digital photo collages that could be uploaded to Apple's iCloud service and shared. iPhoto for iOS was highly praised for its professional tools, good performance and compatibility. iPhoto for iOS was discontinued in 2015 and removed from the App Store in favor of Photos. ^ "Apple Introduces iPhoto". Retrieved May 11, 2012. ^ "Macworld keynote: New iMac, iBooks, iPhoto". Geek. January 7, 2002. Retrieved April 10, 2015. ^ "Apple launches third-generation iPad with hi-res screen, and iPhoto for iOS". Digital Photography Review. March 7, 2012. Retrieved February 8, 2014. ^ "Apple To Cease Development Of Aperture And Transition Users To Photos For OS X". June 27, 2014. Retrieved June 27, 2014. ^ "Photos preview". Archived from the original on April 7, 2015. Retrieved September 9, 2017. ^ "Apple - OS X Mavericks: Supported digital camera RAW formats". Apple Inc. Retrieved March 14, 2014. ^ "Apple - iPhoto 9.5: iCloud Photo Sharing overview". Apple Inc. Retrieved March 14, 2014. ^ "Apple - Print Products for Mac". Apple Inc. Retrieved March 14, 2014. ^ "iPhoto for iOS now available on App Store for $4.99". Idownloadblog.com. March 7, 2012. Retrieved March 16, 2012. ^ Dilger, Daniel Eran. "New iPhoto and iMovie apps can manually be copied to original iPad". Retrieved April 22, 2012. ^ Dove, Jackie. "iPhoto Version 1.0 Review". Retrieved April 22, 2012. ^ Boehret, Katherine (March 13, 2012). "Letting Your Fingers Do the Photo Editing". All Things Digital. Retrieved March 16, 2012.